Read an excerpt and an interview with the author. The Reverend Howard Finster was twenty feet tall, suspended in darkness. Or so he appeared in the documentary film that introduced a teenaged Greg Bottoms to the renowned outsider artist whose death would help inspire him, fourteen years later, to travel the country. Beginning in Georgia with a trip to Finster’s famous Paradise Gardens, his journey—of which The Colorful Apocalypse is a masterly chronicle—is an unparalleled look into the lives and visionary works of some of Finster’s contemporaries: the self-taught evangelical artists whose beliefs and oeuvres occupy the gray area between madness and Christian ecstasy. With his prodigious gift for conversation and quietly observant storytelling, Bottoms draws us into the worlds of such figures as William Thomas Thompson, a handicapped ex-millionaire who painted a 300-foot version of the book of Revelation; Norbert Kox, an ex-member of the Outlaws biker gang who now lives as a recluse in rural Wisconsin and paints apocalyptic visual parables; and Myrtice West, who began painting to express the revelatory visions she had after her daughter was brutally murdered. These artists’ works are as wildly varied as their life stories, but without sensationalizing or patronizing them, Bottoms—one of today’s finest young writers—gets at the heart of what they have in common: the struggle to make sense, through art, of their difficult personal histories. "Economics, semantics and sociology percolate through Greg Bottoms’ engaging and intermittently unnerving narrative… [But] despite the author’s academic bona fides (he’s an assistant professor of English at the University of Vermont) and his frequent nods to the likes of social anthropologist Clifford Geertz and writer Susan Sontag, his subject is personal. . . . Bottoms is impassioned, curious, relentless and angry, but never cynical, least of all about the power of creative expression to salve one’s longings." "[Bottoms is] a writer who avoids the ’automatic and easy assemblage of facts’ by digging below the surface of the story, who keeps writing until he’s staring straight into the face of the only truth that is truly indisputable: his own." "Bottoms is a sophisticated intellectual who does not condescend to, mock or patronise those he has chosen to write about." 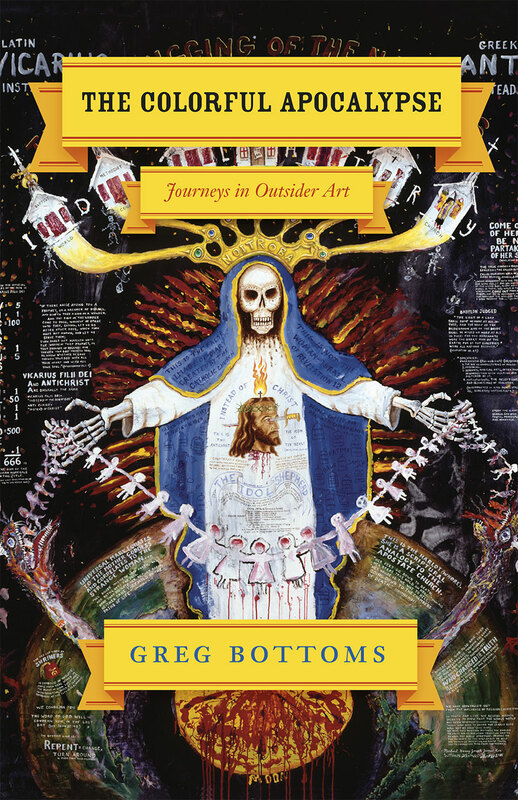 "Greg Bottoms likes to take his readers places they’d never go alone: into the mouth of madness in his autobiographical book, Angelhead, and into the world of religion-fueled art brut in The Colorful Apocalypse. Traversing the Southeast, he meets artists and their followers with a strong belief in the Lord and an even stronger one in their artistic abilities. Bottoms is never disdainful of their naive work, but always has one eyebrow raised in surprise and light skepticism." "The power of this always engrossing and sometimes brilliant book lies not in its general subject per se, but in the way Bottoms uses these outsider artists as a departure to explore the commonsensical ways we determine what’s sane and what’s mad. . . . Because he is such a good writer, Bottoms’s words bring us as close as we should ever want to get to a lot of people . . . [who] possess very creepy hearts of darkness. For liberal blue-staters like me, for whom religious belief has been quieted to a soft background hiss while we strive to value reason over rapture, Bottoms’s book is a stark reminder of the limits of rationality." "The Colorful Apocalypse rings true. . . . [It] is a portrait of a particular kind of human experience snapped by a photographer whose lens is intimately focused."